My sister- in - law and I were gallivanting around and purchasing all Bengalooru goodies like avare kaalu, hurigaalu, obbattu and chakkli on the eve of her departure. All through the four days of her stay at Bangalore, we spent a great part of our time exchanging traditional recipes handed down to us by the elders in our families. We stumbled upon tender green and fresh sundaikkais at Malleswaram Market and bought them on an impulse, remembering how my mother- in - law used to store them in brine. 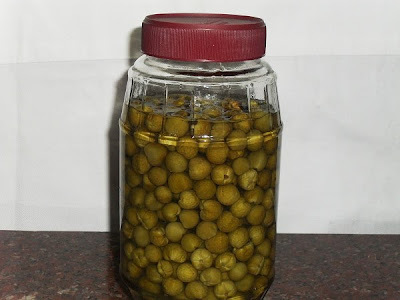 The sundaikkais thus stored in brine can be used for preparing kozhambus or just vadakkals (Sauteed with little seasonings ) as and when required. SOLANUM TORVUM is the botanical name for Sundaikkai. 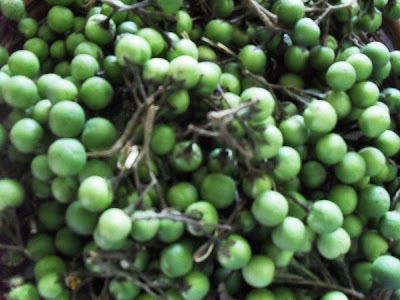 Wikipedia has listed Turkey Berry, Devil's Fig, Pea Eggplant and many more names by which Sundaikkai is identified. It is known as Sondkai in Kannada according to the vendor. 1. Remove the sundaikkais from the bunches . 2. Pick and clean the berries after removing the stalks. 3. Discard the ones which are damaged. 4. Wash thoroughly and spread them out on a kitchen towel for drying. 5. Boil water and salt together. 6. Reduce flame and add the cleaned and dried sundaikkais to the brine and switch off flame immediately. 7. Thoroughly cool the pickle before storing in a clean dry bottle. 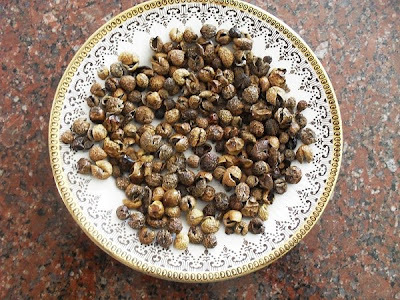 This preserved sundaikkai can be used in preparing various dishes. 1.Filter out a table spoon of sundaikkai without the brine, using a dry spoon. 2.Heat 2 teaspoons of ghee or cooking oil in a small pan or a seasoning ladle. 3.Add the sundaikkai to the hot ghee/oil and saute till it crackles. 4.Pour the popped up sundaikkai over hot steaming rice and relish the unique taste and flavour of the vadakkal. A couple of morsels thus savoured at the beginning of a meal is very good for digestion. It is believed that sundaikkai has the power to even eliminate harmful bacteria from the system. 1.Grind coconut gratings, green chilly, fresh ginger gratings and salt into a smooth paste. 2. Mix the paste into the thick curd and keep aside. 3. Heat oil in a small pan and add mustard seeds. 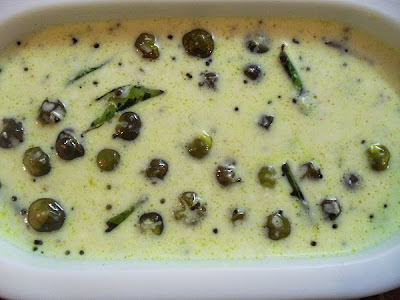 4.When the mustard seeds crackle add curry leaves , and then add the sundaikkai. 5. When the sundaikkai cracks add turmeric powder. 6. Add the curd mixture and immediately switch off flame. Mix well and savour with steamig hot rice. SUNDAIKKAI has great healing properties. Periodic consumption of this berry helps in maintaining a healthy digestive system and keeps coughs and colds away. Sun dried sundaikkais are available in super markets. This can be deep fried and savoured as an accompanimet with the main meal. Sundaikkai vattal kuzhambu is a gravy where the dried berries are fried with the seasoning and cooked in a tamarind based gravy. A WORD OF CAUTION - Sundaikkai has a very bitter taste. Hence only a small quantity (which is powerful enough to act as medicine ) can be used at a time. 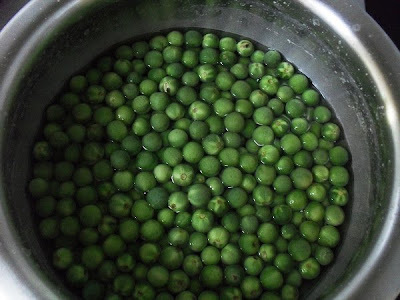 It can not be savoured like green peas. Sauteing or cooking with ingredients like tamarind , salt , spices and jaggery helps to tone down the bitterness to a certain extent. You are sure to enjoy this medicinal berry if you develop a taste for it. Neer sundakkai is new to me. How I wish I knew this while I was at Palakkad. I had the plant in my backyard. I usually sundry them and make porichakuzhamby using fresh ones. Didn't know they could be preserved in brine.....I have always used the sun dried version. The fresh one tastes great in sambar. Hi Chitra...thanks for dropping by my blog and for the sweet comment. I have never tried or even seen this berry , with your description , i would surely pick this up whenever i spot them. Amazing recipe, i made this neer sundaikaai and also the more kuzhambu. Thanks for sharing! !